Rob Kaufelt grew up in a grocery family – his grandfather had a shop in Perth Amboy, New Jersey, where he’d hang out and hear Grandpa use his motto “Go on, take a taste” with every customer. After graduating from Cornell University, he joined the family business, where he managed the company’s rapid growth in the 1980s as President. Rob eventually moved to the Village and decided he was going to work in specialty foods. He was standing in line one day at Murray’s, when he heard then-owner Louis Tudda say that he was closing the shop. Rob made him an offer, becoming just the third owner of New York’s most beloved cheese shop. A frequent writer and educator, Rob has been profiled in Crain’s New York, The New Yorker and the Daily Meal, and he authored The Murray’s Cheese Handbook (Random House, 2006). 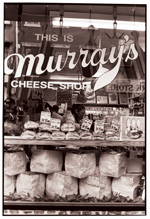 In 2008, Murray's entered into an agreement with The Kroger Co. to expand Kroger’s specialty cheese program. Murray’s cheese shops can now be found in 350+ Kroger locations in 30 states. In 2017, The Kroger Co. purchased the equity of Murray’s Cheese, as well as the flagship store on Bleecker Street, to form a merger of the two companies. Rob remains with the company as a strategic advisor.